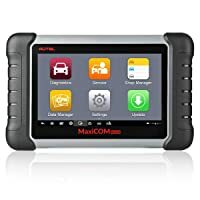 Want to read the honest reviews of Autel Maxi Pro MP808TS All-System OBDII Scanner with TPMS? I bought my Maxi Pro MP808TS directly from Autel on Amazon. In addition to getting a reliable warranty, buying directly saved me a few bucks over the listing price of most shops. And it arrived very quickly. 4 Who is it suitable for? 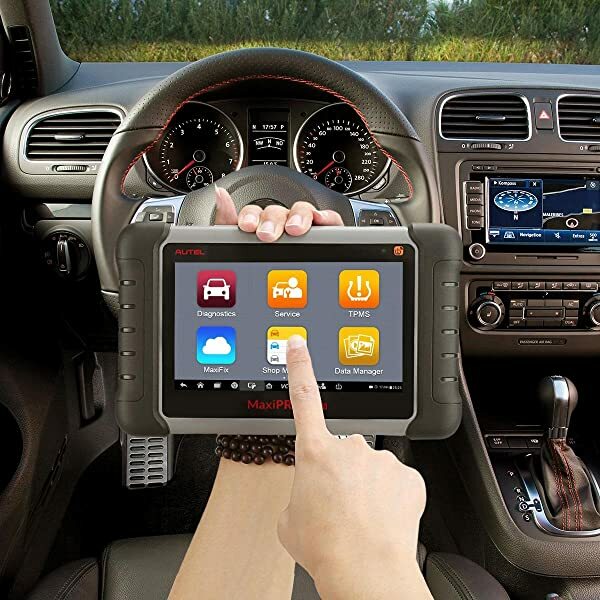 Autel makes some of the best diagnostic scan tools. I’ve used a number of them working as an auto repair shop manager. However, one that I hadn’t tried until recently is the Autel Maxi Pro MP808TS. Well, it only became available on the market in 2017, so it’s a fairly new OBD2 diagnostic scanner. But I finally got my hands on one. Of course, the first thing I did was put it to test to see if I can rely on it as a professional OBD2 scan tool. First of all, I bought my Maxi Pro MP808TS directly from Autel on Amazon. In addition to getting a reliable warranty, buying directly saved me a few bucks over the listing price of most shops. And it arrived very quickly. This device is a combo of the MaxiDas DS808 and MaxiTPMS TS601. It actually looks and feels solid. Plus it was delivered in a nice looking box that you can use as a carrying case. Although you can use it straight out of the box, you need to update its software first. Otherwise, you may run into compatibility and functional problems if you stick with the old firmware. Just as a heads-up, the old software doesn’t support USB connectivity. If yours doesn’t connect to a PC, it means it doesn’t use the latest software update. You will need to remove the microSD card, insert it into a card reader and then download the updates to the card. That will allow you to install them on the scanner. The upgrade process is perhaps the most straightforward you will get. Simply go to Autel’s website, set up an account and then register your scanner by entering its serial number. it was delivered in a nice looking box that you can use as a carrying case. Make sure it (the scanner) is connected to Wi-Fi. It will automatically download the latest software update. You will also get free updates for the lifetime of the product. The unit is made in a tablet-like design and runs on Android. Operating it is a breeze, especially if you have the slightest experience with smartphones and tablets. 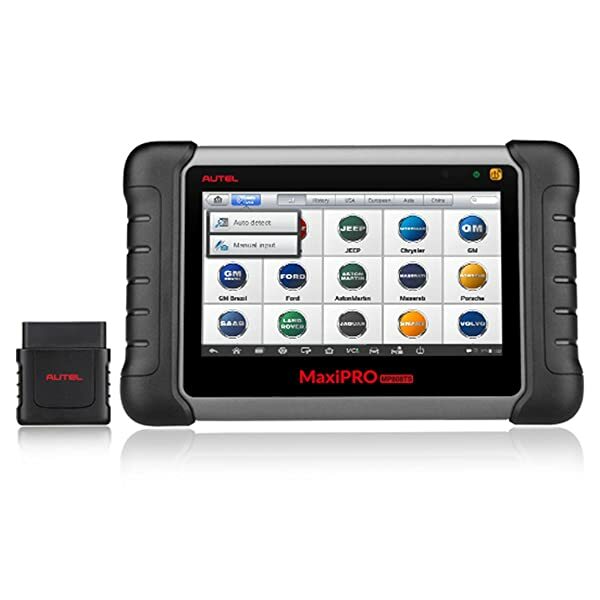 The Autel Maxi Pro MP808TS is an OBD2 scanner. As such, it covers 1996 and newer vehicles. 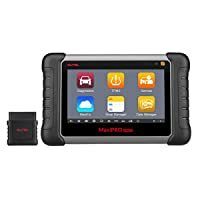 It should work on your vehicle provided the vehicle has the universal OBD2 connector. That goes for local and foreign makes and models. It doesn’t matter if your vehicle was made in the USA, Europe or Asia. This scanner should work provided the vehicle is OBD2-compliant. Not sure where the OBD2 connector is in your vehicle? For most vehicles, you will find it under the dashboard just beneath the steering wheel column. Other vehicles have it located in different places, e.g. just under the gearbox. It’s a 16-pin port where the main OBD2 cable of the Autel Maxi Pro MP808TS plugs into. It really is a comprehensive scanner that works on just about every OBD2 vehicle. In all cases, it was connected to the ECU, it did so very fast and worked like a charm. Unfortunately, it didn’t connect with every vehicle I tried it on. Which leads me to my issue with the scanner’s compatibility. The biggest concern is there’s no way to know which specific vehicle models and years it will work on before you buy it. And believe me, it doesn’t work on every OBD2 vehicle. For instance, it couldn’t connect with a 1998 Dodge Caravan and a 2012 FIAT 500 Sport. Its 2018 and Autel still don’t have the database for such vehicles in this scanner. That’s very unfortunate! This scanner is a comprehensive diagnostic tool with the ability to read and clear codes on all the four main vehicle systems; i.e. engine, ABS, SRS, and transmission. Another basic diagnostic function is the smog test. You can use it for I/M readiness and O2 sensor tests. 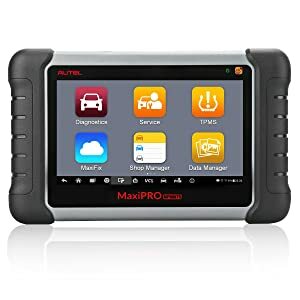 Codes and emission tests are what most vehicle owners are interested in most and the Autel Maxi Pro MP808TS offers both. I like that this scan tool checks and clears SRS and ABS codes in addition to engine and transmission codes. It makes it so easy to reset the Check Engine Light and clear warning lights. Codes come with their definitions thanks to a built-in lookup library. If you are completely new to diagnostics you will find it very easy to interpret codes and erase them. And the emission tests mean you won’t have to worry about the smog test. You won’t even need to visit an auto shop or Autozone to do your emission checks. You can pull and clear transmission, ABS codes on most compatible vehicles, but not all. I, for one, couldn’t get the scanner to read them on a 1999 Ford F150. It did pull codes for the engine and SRS though. Bonus: SRS Light / Airbag Light on – What should I do? 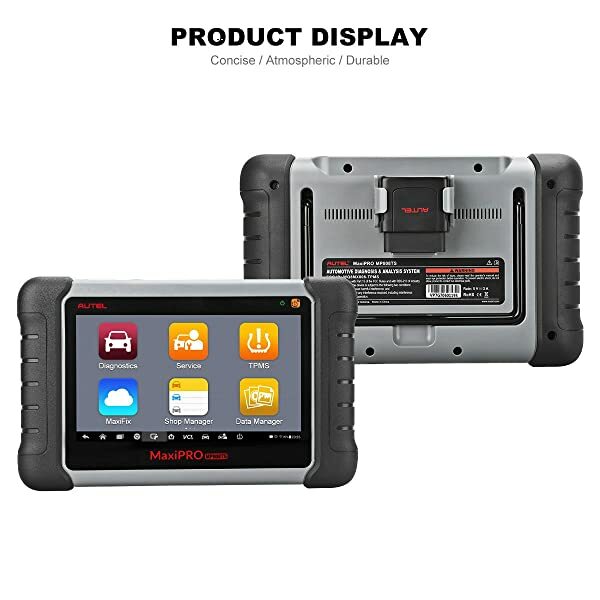 The functions of the Autel Maxi Pro MP808TS go way beyond basic diagnostics. It supports a ton of other special functions. Other functions include electronic throttle relearn, transmission adaptation and re-initialization of ABS. All those abilities are impressive but this scanner is especially excellent in TPMS functions and diesel particulate service. As for TPMS service, the scanner allows you to activate data for TPMS sensors and diagnose TPMS ECU. For the latter, you can do DPF regeneration (injector rate adjustment, injection quantity, injection rate, particulate filter test, and particulate filter regeneration). The icing on the cake is that you can read TPMS sensors right at the wheel, not necessarily through the OBD2 connector. If you are being bugged by one of those “service due” lights just know that you can reset it with the Autel Maxi Pro MP808TS. That alone makes the case for this scanner. More importantly to a professional or DIY mechanic is the fact that it offers a wide range of advanced functions. Again, my complaint here has more to do with compatibility. I couldn’t get the scanner to perform any advanced functions on a Toyota Prius. If you own a Prius (and I guess any other hybrid), you can only use basic diagnostic functions. It also failed to perform any DPF functions on a 2015 Ford F-250s. It’s even more disappointing when you consider that the car is now 3 years old. Autel being a renowned brand you would expect them to update their database ASAP. Another impressive feature of the Autel Maxi Pro MP808TS is the tons of data it provides. In addition to trouble codes, you can view live data streams for the engine, SRS, ABS, and transmission. It allows for data graphing and you can view up to two graphs at the same time. And then, of course, there is TPMS data where you can view sensor ID, tire temperature, tire pressure, sensor position etc. On the topic of viewing data, the scanner’s full-color screen makes for a great viewing. It is big – tablet size – and that makes data analysis kind of fun and easy. The scanner did a very decent job in monitoring live misfires on the cylinders of a 2004 GMC Envoy. I could clearly see the cylinders that were not firing. The refresh rate is disappointingly slow. You will have to wait for several seconds before the scanner displays data again after refreshing. The device excels in connectivity. I’ve already mentioned that it supports USB connection and has a microSD card slot. In addition to those two, there’s also a port for HDMI type A. Even better, the Autel Maxi Pro MP808TS supports wireless connectivity; both Wi-Fi and Bluetooth. Wi-Fi enables you to update the scanner’s software and go online when you need to research diagnostic stuff. FYI there’s a browser app for that. On its part, Bluetooth is for connecting to Bluetooth-enabled VCIs. 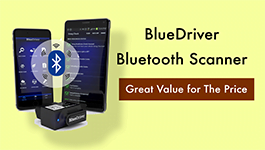 As long as the vehicle’s computer systems support Bluetooth connectivity you can run your diagnostics wirelessly. There’s nothing special about microSD and USB, many OBD2 scan tools have that capability. It’s not the case with Wi-Fi and Bluetooth, those are typically available in high-end scanners and adapters only. While Wi-Fi is undoubtedly valuable, for me the Bluetooth functions are more important. It enhances mobility as you work. You can literally walk around the workstation without losing the Bluetooth connection. Unless your scanner is using the latest update, you won’t be able to connect it to a PC via USB. That’s why updating the firmware should be the first thing you do. Update fee after the warranty is a little bit high. The Autel Maxi Pro MP808TS is definitely not perfect and still needs some improvements. However, it brings a lot to the table, especially for professional and DIY auto technicians. But just in case you are not sold on buying it you could consider one of its closest counterparts from Autel. Bottom Line Autel MP808TS is an excellent diagnostic tool for mechanics Only. Autel MK808 suits any experienced enthusiasts and beginner mechanics. Autel MD808 Pro is great for experienced enthusiasts and beginner mechanics. 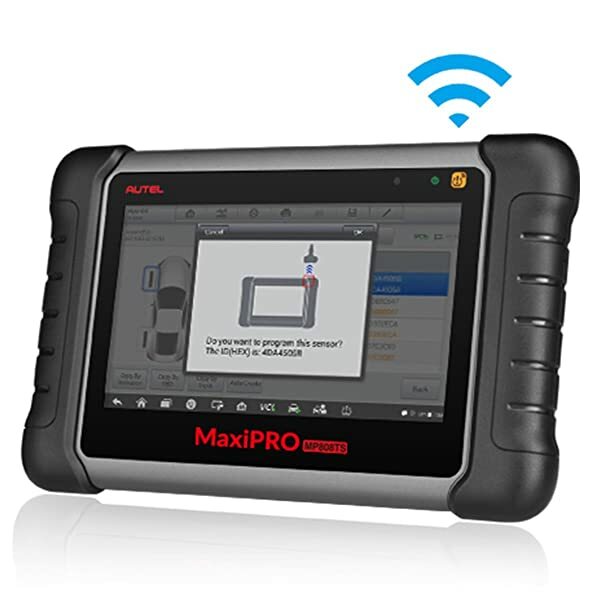 There’s no doubt the Autel Maxi Pro MP808TS is a solid scan tool with lots of diagnostic functions to offer. But who can it serve best? In my opinion, it is a professional diagnostic tool that can also be used by DIY enthusiasts. The wide vehicle coverage, basic & advanced diagnostics, tons of data and impressive connectivity make it a great buy for professional and DIY mechanics. Remember that a fully-fledged professional scan tool will cost you more bucks than this. Despite its flaws, the Autel Maxi Pro MP808TS is a great pick for any auto mechanics scan tool. 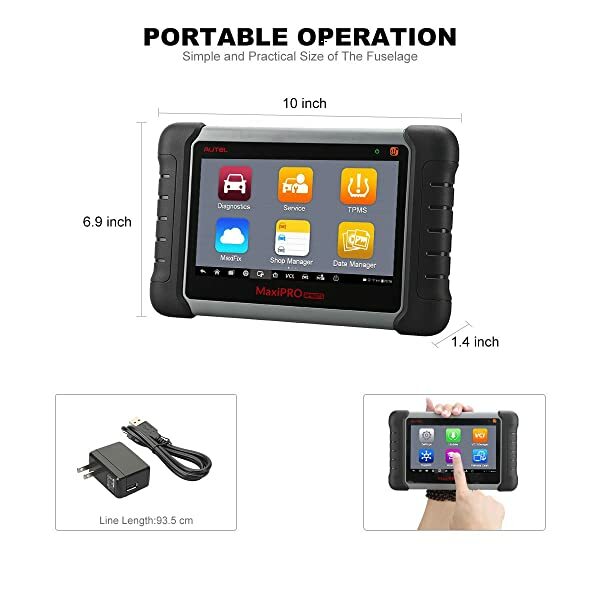 You’re a fan of Innova OBD2 Scanners and you are interested in Innova 3160g? In this article, you will find everything related to Innova 3160g Scanner. I,m in the electronic diagnostic service and repair for several years and need to change my maxidas DS708. Is the best honest review i see. You say in the “Pros” section that this tool has lifetime free updates. Where did you get that info. According to other sellers the updates cost $599 after the first year. Sorry, Wayne. I think they’ve just changed the warranty policy. It’s 12-month now. Will get it updated shortly. Thanks.